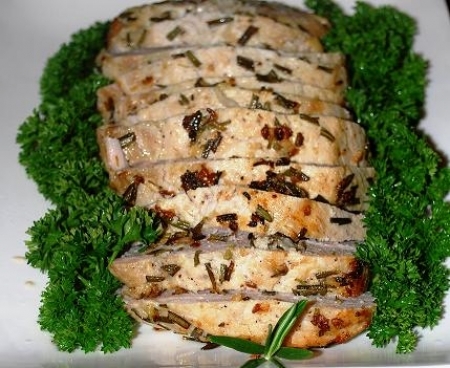 Pork tenderloin is a great meat for feeding a crowd or cut in half feeding a small family. The pork needs to marinate for several hours or more, all day is preferable. Rinse pork and pat with a paper towel to dry. Set aside. In a medium bowl mix the remaining ingredients, except for the 2 tablespoons of olive oil for searing the meat. Place pork in a gallon sized Ziploc bag and add rub. Close bag and massage the rub evenly over the pork. Place in fridge and massage a couple of times during the marinating process to make sure the pork is evenly coated. Try to marinade the pork for at least four hours and preferably longer. Remove pork and any of the rub that you can from the bag. In a large cast iron skillet or regular skillet, heat 2 tablespoons of olive oil over medium high heat. Sear pork on all sides. Depending on the size and shape of your tenderloin this may mean 2 sides or 4 sides. For the one above, it was two sides. Transfer to a baking sheet lined with foil or coated with non-stick cooking spray and bake uncovered in a preheated oven at 375 degrees for 45 minutes. Cooking time will vary, depending on the size of the meat. Let meat rest for 10 minutes, slice and serve. Baked New Potatoes, (take adavantage of your oven being on and pop these in at the same time), Whole Wheat Organic Couscous, Garlic and Herb Rice or Lentils with Garlic and Fesh Rosemary. Try Rodney Strong Pinot Noir (California), Pedroncelli Pinot Noir (Russian River Valley, California), Healdsburg Ranches Appellation Series Pinot Noir (Russian River Valley), Flensburger Brauerei Pilsener Lager German Lager Beer (Germany), “Old Speckled Hen” English Fine Ale or Bass Pale Ale (England).